In an investor call EA has now admitted the lack of a story was purely to hit the latest film’s release date. Speaking in the call, Patrick Söderlund, executive vice president of EA Studios, said: “It was a conscious decision we made due to time and being able to launch the game, side by side with the movie that came out, to get the strongest possible impact”. That's despite not actually having any direct content from Ep 7, only a cross over 'Battle of Jakku' DLC map. 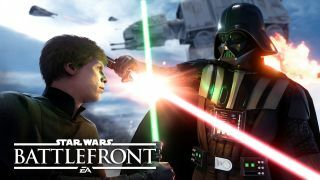 That moving forward likely refers to the another previous EA call where it confirmed that a new Star Wars Battlefront was on the way with content “from the new movies”.